Fine wire drawing machine with continuous annealer maker : Pan-Pioneer Co., Ltd.
PAN-PIONEER Co., Ltd. is a copper and aluminum wire drawing machine maker. 1.1.) Type: Copper conductor wet fine wire drawing machine . 1.4.) Line speed: 40 MPM Max (at 0.127 for example). 1.7.2.) AC motor with encoder feedback for take-up. 1.8.) annealing machine annealer capacity: High frequency 45KVA (Patented) transformer system. 1.9.4.) Steam/Nitrogen/water three ways of oxygen-proof for discolor prevention. 1.9.5.) 2 contact sheaves compact type. 1.2.1.) fine wire drawing machine No need steam or Nitrogen needed for wire anti-oxidation (discolor) during annealing machine annealer process. 1.2.4.) fine wire drawing machine for Different material, different sizes of product parameters can be store in CCCS and recall them while making the same products. 1.2.5.) fine wire drawing machine for Semi-hard wire production is applicable (10% -20% for example) for special application. 1.2.6.) 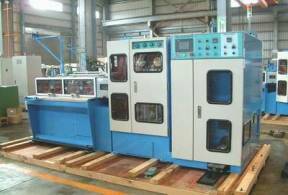 Precise annealing machine annealer power control at low line speed for hard wire elimination. 1.2.7.) Vibration eliminator equipped in annealer for High speed operation. 1.2.8.) Foldable wire drawing cover with viewing windows, which is made by tempered glass. 1.2.9.) fine wire drawing machine Safety door with viewing windows on annealing machine annealer machine. 1.2.10.) annealing machine annealer lubricants level viewing windows for fine tune the annealing machine annealer result. 1.2.11.) Built-in stainless wire drawing and annealing machine annealer lubricant tanks which save the spaces and easier for copper dust cleaning. 1.2.12.) Completion of both Internal circulation / external circulation piping system with wire draining machine pipe connectors. Machines can operate independently or with lubricant tank shared with other fine wire drawing machine. 1.2.13.) Copper dust collectors in internal circulation pipes for collecting copper dust of fine wire drawing machine . 1.2.14.) Color touch screen monitor for more easier operation on fine wire drawing machine . 1.2.15.) fine wire drawing machine Precise weight-balancer type constant tension control, which overcome the disadvantage of the spring-type tension control. 1.2.16.) High accuracy fine wire drawing machine close loop speed control for constant quality products. 1.2.17.) Anti-Corrosion high accurate Forged fine wire drawing machine die holder rather than casting ones. 1.2.18.) High-frequency / High-efficiency (95% and up) transformer rather than traditional low efficiency transformer (80% maximum). 1.2.19.) Maximum fine wire drawing machine line speed achievement (2000mpm) Once the I.D. of the take-up bobbin reach the minimum I.D. of fine wire drawing machine mechanism design requests minimum I.D. For example, this machine is designed 2000Mpm with DIN 46397 315mm bobbin. To achieve, the mechanism design of take-up stand, the maximum rotation of take-up shaft is 4500rpm for the inner diameter of the 315mm bobbin. When this machine is utilized on 250mm bobbin , for example, the I.D. of 250mm bobbin may smaller than I.D. of 315mm bobbin , therefore when the take-up reach 4500rpm, the line speed will still lower than 2000mpm ( the line speed should be 4500rpm* 3.1416* I.D.). Under such circumstances, fine wire drawing machine will slow down to keep the synchronization between them. When the take-up reel I.D. is increasing due to the drawn wire rewound on the bobbin, the maximum line speed take-up bobbin is increasing as well. Drawing machine will increase the line speed automatically to match the maximum line speed the take-up bobbin can reach until the line speed reach the maximum of the fine wire drawing machine (that’s say 2000mpm- 2500mpm) and keep the fine wire drawing machine speed constant until the take-up bobbin is fully loaded. IOW, the whole system of this fine wire drawing machine may operate at highest speed its mechanism can reach. This system won’t let any parts of fine wire drawing machine over speed. Once anyone of them has reached its maximum capacity, the machine will limit the performance of this machine and increase / decrease maximum line speed anytime once any factors which limit the maximum line speed are disengaged or activated . In short, this fine wire drawing machine can keep running at its highest performance automatically by internal control software (CCCS) for Users. No other machine maker can achieve except Pan-Pioneer. 1.2.20.) High-speed communication for system annealing machine annealer and synchronization control. By using this technology, the wiring job becomes very compact, easy for maintenance and diagnosis once failures occur. The other advantage of this fine wire drawing machine is this high speed communication system is total immune to environment noises generated from other devices, such as SCR controller , AC inverters, or electric drills…etc. The similar technology that we call it “fly by wire” is also adopted on some modem vehicles such as BMW, BENZ…etc. Pan-Pioneer is the first one and the only one who use this technology on practical products and acquire great success, Many of our customers use this machine at different materials for over at least 11/2 years without any complains about it. We are also one (and the only one) not Japanese based machine maker who is a qualified fine wire drawing machine supplier . 1.2.21.) Remarks: all the contents listed in this quotation has been tested with oxygen-free copper and Tin-coating copper wire. Other material of wire drawing test result may not be the same as which listed Herein. 1.3.2.) Tin plated copper is suitable for apply in this fine wire drawing machine . 1.9.) Type and stages of drawing capstan :4 units of Cone type with 10 steps for each drawing capstan plus inlet and final drawing dies. 1.10.) Drawing die holders : Total two sets, each set with 10 arched die holder which are made of forged stainless steel. 1.11.) Spooler: 305/315/335 mm(OD)*127mm(ID)*214mm(W). (or custom-design) swelling type. 1.12.2.) 10HP vector type AC motor with Vector type inverter with encoder control. 1.13.) Annealing machine capacity: High frequency transformer system. 1.15.) ModBus high speed communication signal control system. 1.16.2.) Easy clean fine wire drawing machine stainless cooling tank with pump for circulation with optional heat exchanger and copper dust filter. 1.16.3.) 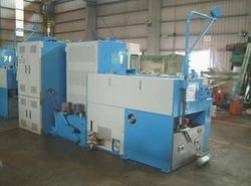 Independent annealing machine annealer curves to different wire sizes. Curves can be fine tuned if needed. CCCS system can memorize up to 20 annealing machine annealer curves which can be recalled anytime changing the wire drawn sizes. 1.16.5.) annealing machine annealer 3 contact sheaves compact type.